Lets find out what everyone's favorite veggie is on NT. Lets just say you had to pick only one veggie that you could only have for one whole year....What would it be? Please, no politics and religion, and be polite. Thank you. Tell us what your favorite veggie would be? Good choice. Not what I'm going to post but broccoli? You can cheese, butter, stir fry, raw, soup....oh, the possibilities! My personal favorite is steamed and buttered asparagus. Love it! A lot of people like that on here. Cut the spears up into 1" lengths, pan fry with real butter and mrs. dash seasoning and maybe a touch of garlic.. Fantastic. Actually I do do that on occasion. That is the way my late wife enjoyed them as well. My thanks. I never tried peas with anything on them, I will have to give it a try. I cheat when I put lots of butter on mine.. If a tomato wasn't a fruit I would have picked it, but my pick has to be potatoes. They are a staple, a comfort food, can be prepared in many ways - baked, boiled, mashed, whipped, fried, roasted. Many people in Ireland survived by eating nothing but potatoes for a long time. I was thinking about tomatoes too, Maryland tomatoes are so good. Have you ever tried Heirloom Tomatoes? Not sure if I ever had. I buy corn, tomatoes, cantaloupe and green peppers from a local farm. They have a type that does not have a strong taste and low in acid. I know there are many varieties. I agree. I go through a 5 bag in about a week. Reds only, and the newer the better. And the more butter is involved, the better. I forgot about potatoes.. You can do so much with them like corn. Saw a good one the other day on potatoes. We get chips, French fries, and vodka from potatoes. It's like the other vegetables aren't even trying! If I could only have one in my life, it would be corn because of it's versatility. You get another pick Buzz. Potatoes are not a vegie...edible tuber. LOL Dulay - good catch. A tuber it is. Okay, then I'll go for one that most people hate - Brussels sprouts. I really like the taste of them. I know potatoes are not considered a veggie, but corn too? They look at potatoes as more of a starch like rice and noodles. I do know that corn has more starch in them then most veggies. Again, corn is a grain. Picture it as a giant wheat stalk. I don't want to upset the the classification police. Yep. It does. They are fattening too. Answering the question of whether or not corn is a vegetable sounds like it would be simple. In fact, it’s a little more complicated than it appears. To complicate things a little more, many grains including popcorn are considered to be a fruit. This is because they come from the seed or flower part of the plant. In contrast, vegetables are from the leaves, stems, and other parts of a plant. This is why several foods people think of as vegetables are actually fruits, like tomatoes and avocados. So, corn is actually a vegetable, a whole grain, and a fruit. But no matter what form it comes in or what category it falls into, corn is good for you and can be part of a healthy diet. Even plain popcorn can be healthy when prepared without oil, butter, or salt. Or is that a fruit? This talk of corn reminds me. When I was a teenager in Maryland, the farmers sold corn on the cob out of their trucks (I heard you were from there). It was called silver queen corn, or something like that. We use to buy it and have to peel it ourselves, even pull the little strings off. Some people cooked them without peeling anything off. I always liked to look for worms. It was the best corn I have had. Of course this was about 30 yrs ago. It is Silver Queen corn. It's a very old variety. Yep, silver Queen corn. It was a sweet white corn with small kernels. Delicious. My parents would get it and I ate it growing up. I have not seen it for a while. The seed is still available. My dad always grew Illini and Iochief. I have not seen it for a while, but that is great. I have been getting the white and yellow corn on the cob. It is so delicious. It's a mix of white and yellow kernels on the same ear. Next year, I will look for it, I thought they did not grow it anymore. There are very few vegetables that I don't like. Don't lie Two Shoes, you love ALL vegetables! I'm not Ms. Goody Two Shoes. I don't like peas, but I'll eat them. You're NOT Ms. Goody Two Shoes, because you eat the vegetables you don't like? Ooooook then! I wouldn't cook them for myself but if I'm in a restaurant or at someone's house I eat them to be polite. I had to pick and shell peas for hours as a kid and they just don't taste like much. I'm not a fan of 95% of fresh tomatoes because they just don't taste like much, especially between September and July. I've always grown tomatoes and I know what a proper tomato tastes like. I hate the rubbery pink things on most burgers and salads. If a mushroom is a veggie then they are my favorite, either that or Brussel sprouts. Peas are not my favorite either, I would have to have something on them. Umm, well, I guess I politicized your vegetable blog...sorry! I just got back from picking up my daughter, I did not see it. So what is your favorite vegetable? Lol, that's what I said, my favorite vegetable, but it got deleted! I would pick Kale even though I don't really care for the taste. I eat it because it is considered a superfood high in nutritional benefit. You're gonna croak anyway Deano, I hate to tell ya! I like Kale too, with lots of butter. I eat it because it is considered a superfood high in nutritional benefit. Kale is a member of the group of Cruciferous vegetables-- and they all have similar nutritional benefits": Collard Greens, Broccoli, Brussel Sprouts, Cabbage, Cauliflower, and Broccoli Rabe. Okay, okay, okay, black olives. Maryland doesn't have crabs they steal them from VA waters then call it Maryland blue crab. LOL, I get them from the Smith Island watermen who get them in Maryland waters. Cherrystone Virginia is known for their clams. I'll munch them all down. You get another pick too. Olives are a fruit. LOL, I get screwed up on the borderline things. Like Buzz I would say Tomatoes, but remember that is fruit. Then I will go with potatoes. Mmmmm, potato and catfish pancakes. There is no real argument for potatoes being classified as fruits since fruits are the seed-bearing structures that develop from ovaries of the plant. Potatoes are tubers and don’t contain any seeds, so it is easy to eliminate fruit as an option. Most people consider potatoes a vegetable, and botanically speaking, that would be correct. Potatoes are an edible plant part, namely the starchy tuber that grows beneath the ground. Ohh so they really are then..
At least according to some sites. hen I will go with potatoes. a much thickened underground part of a stem or rhizome, e.g. in the potato, serving as a food reserve and bearing buds from which new plants arise. a tuberous root, e.g. of the dahlia. a rounded swelling or protuberant part. My three favorite foods are eggs, potatoes and tomatoes. Not a vegie among them though I eat vegies a plenty. BTW, I'm a horticulturalist so I know a little about this. 1. What is the difference between a fruit and a vegetable? I don't doubt your credentials. just referencing other sites as in post 8.3.6. Interesting. If so, then my potato choice is correct. Now, rhubarb is used for its stem (love strawberry-rhubarb pie) so is it a vegetable? Now, rhubarb is used for its stem (love strawberry-rhubarb pie) so is it a vegetable? Do you know the plant with the big green leaves and a long red stalk? Rhubarb (Rheum officinale Baillon) is a very undemanding perennial vegetable. Wrongly, Rhubarb is often counted among the fruit species. This is due to its sour, fruity taste and the fact that it is mainly used for desserts. The harvest time begins in April. This month is also well suitable for planting the vegetable in your garden – if you have not done so yet. Love my Asparagus, both white and green! Grilled, steamed, stirfried, boiled doesn't matter, naked or top them with any number of sauces. Mmm now I've got a hankering for some garlic and herb buttered asparagus with bacon bits. Lol you're not wrong there, but well worth the price imo. BTW white asparagus is worse that green for the after smell. BRUSSEL SPROUTS smother cooked in butter and bacon chips, and covered with melted cheese on top when served. Brussel Sprouts do smell like dead fish when being cooked, but the end product is worth it. Try giving them a quick pan cooking in butter to soften them up a bit, cut them in half and put a small thin piece of velveta cheese in the middle, wrap a small bacon piece around them, stick it with a tooth pick, and then stick them under the broiler until the bacon gets a little crust on the edges. Yep. I chose Brussels sprouts when I was told potatoes were tubers, not veggies, but now it's been pointed out that tubers ARE veggies. Baked Potato's.....loaded...… are great ! I do the same with water chestnuts. So that's why they're so good. They do look like a mini brain, if you think about it. They call cauliflower that too.. They do, I like them roasted with garlic. ooooooo….… I love that to.....with melted Cheese on top. Sorry, I have this "Cheese" thing when it comes to veggies. Something about the combination. Maybe it's just the cheese. Just because I'll cut a 2" to 3" piece of cheese from a block and sit down with it in front of the TV.....doesn't make me a "Cheese" hound. Boiled with corned beef....mmmmm TASTY. Yep! I do it all on one pot, cabbage, potatoes and ham or corned beef. Or, ham with cabbage,carrots, and potatoes was "New England Boiled Dinner"
Coming in the house from a c-c-c-old winter day in upstate NY, that was a welcome smell. The Chinese people are SO unaware about cheese. They only cheese they seem to know about is sliced processed cheese that's put into cheeseburgers, and they probably didn't even know about that until McDonald's came to town. Processed cheese is the only kind that is carried in larger supermarkets - small stores don't bother. I have to travel for almost an hour to go to the METRO big box store that imports many foods to buy real aged cheddar, Emmenthal (sp? ), Danish blue, brie, Camembert, Swiss and Parmesan. But even they don't carry Stilton, my favourite. I LOVE cheese - eat some every day. In French, Brussel Sprouts are called "Peitit Choux"--- one translation of that is "small Cabbages". They look like miniature cabbages. Stronger in taste like the heart of a large cabbage. That's how my Irish granny did it. The house smells good too! You sure you like Brussel sprouts or cheese and bacon my wife likes them with oliv oil sea salt cooked on the flat top. with oliv oil sea salt cooked on the flat top. The "Sea Salt" part got me. Yes! I tried them that way too, very good. Salt IS a food group. I just roast them with onions, garlic, S&P, and olive oil. Mu mom boiled them until they fell apart and I hated even the sight of them. That's me I can't eat them boiled I love grilled asparagus with olive oil garlic sometimes my wife marinade s them in Italian dressing. Maryland doesn't have crabs the steal them from VA waters the call it Maryland blue crab. Pole beans or pintos, seasoned with pork and served with cornbread and iced tea. Black eyed peas are a favorite of mine. I buy Glory brand, they have a smoky taste. Why can't you have onion with it? I thought I was supposed to pick only one for the year, that's what I meant about the concession on the chow-chow. I mean once it's canned it's technically not a vegetable anymore.....right? Yes... that's right, I thought you were not suppose to have onions for some reason. I get what you are saying now. Chow chow has many veggies that are pickled. Pick again, beans are seeds. I'm pretty sure that beans fall into the vegetable group. Vegetable: has a very broad description, basically any part of a plant that is edible for human consumption. but they are all accepted as vegetables, except mushrooms. Botanically speaking fungi are a separate group from plants and genetically are closer to animals than plants. Another oddity; honey is technically considered raw meat because it is an animal ( bees) byproduct. It's okay with me... If you think it's a vegetable and you like it, go for it..
Legumes — a class of vegetables that includes beans, peas and lentils — are among the most versatile and nutritious foods available. Legumes are typically low in fat, contain no cholesterol, and are high in folate, potassium, iron and magnesium. They also contain beneficial fats and soluble and insoluble fiber. But isn't it composed almost entirely of sugars and water? The low water content helps prevent honey from spoiling. Honey has 2% minerals and protein, compared to zero in white sugar. My favorite vegetables are the mushrooms on top of a 16 oz steak! Or with REAL Australian or New Zealand lamb chops. The ones that look like wishbones slow cooked in basil. Not that white creamy basil sauce. Olive oil, basil and other herbs and spices. I like sauteed onions on mine. Stuffed mushroom caps are so good. they are not considered veggies because they are not derived from plants. Gosh! From Kathleen's first post through all the comments my imagination goes wild. I love vegetables and love to cook. Had to come down to my taste which is asperagus. I think the hollandaise image got me. Sweet potatoes. They can be boiled, steamed, fried, mashed or added to soup/chili. Savory or sweet. I also make sweet potato biscuits. If for some reason I did not have pumpkin or winter squash, I could envision using them as a substitute in pumpkin bread or incorporated into zucchini bread. My husband hated sweet potatoes because his family only fixed them with marshmallows during the fall/winter holidays. He changed his mind about sweet potatoes the first time he ate them fried in the oven with cajun seasoning. I have a family member that has me make sufficient for him to take some home and freeze for his enjoyment all year long. I never tried them, I was not to crazy about the smell. Maybe one day I will. If you like butternut squash soup, you might try adding a sweet potato. Sounds like a great fall dish. Okay, they are in season for fall and winter. Slice it open length wise and top with butter, cinnamon and brown sugar. One of my favorite fall/winter desserts that is fairly quick and very easy. I slice mine in half and steam them. I do not own a microwave (by choice). I, also, like to mash them and add them to oatmeal and raisins (with butter, cinnamon and brown sugar). Sweet potatoes are the dickens to stop once they're established. Why would you want to stop them? Keep them contained in a raised bed or other predetermined area. You 'might' get runners trying to escape, but they're easily dealt with. We grew them at the prison and it was hell chasing it down in rotations. 5 acres was a test plot. We had 274 acres we grew on. How about some screwy sounding rules? "Nothing that grows over 3 feet tall"
I simply bake a sweet potato like a white potato. I just put hot sauce and maybe salt on them for a healthy starch side. I care not what other people say..... BACON goes with EVERYTHING and it needs nothing to make it better. I am making bacon and eggs for dinner tonight. Growing it can be slightly problematic unless one has some very understanding or very distant neighbors as it tends to, well, stink up the area somewhat. However, once picked the preparation process is quite aromatic predicated on the technique and flavor desired.... hickory, maple, cherry or a combination of those and other conditioners. I admit to generally being lazy and prefer the already precooked Hormel/Kirkland variety available at Costco. However, I have been known to utilize the cooking variety, but then prefer the Cracker Barrel brand available at some stores. I DID prepare a slab in a smoker for later consumption using mesquite and cherry hardwoods for a delectable flavor, but it was honestly too damn long to wait for the end product. Now, others can do it and I'll enjoy it!! I am making bacon and eggs and possibly biscuits and gravy. I had planned on heating some red beans and rice leftovers and making a pan of cornbread with okra and onion. I guess that will have to wait until tomorrow night. LOL! I use the base recipe below. I mix the dry ingredients, put them in my food processor. Cube the butter and add it to the food processor. Pulse it a few times to incorporate the butter. Pour into bowl and add wet ingredients. Knead 6-8 times on a flour covered pastry mat. Roll out 3/4" thick. Cut out and bake on a parchment lined cookie sheet. I rarely have buttermilk so I mix some sour cream or plain yogurt in the milk to make 3/4 cup of liquid. Thank you, I would like to make them with the gravy. Yeah, my kitchen shook when I read that too. Try it you can control the cook better and cook more I have convection oven and can cook 1 LB bacon in 12 minutes with no mess. I've done it in large volume. 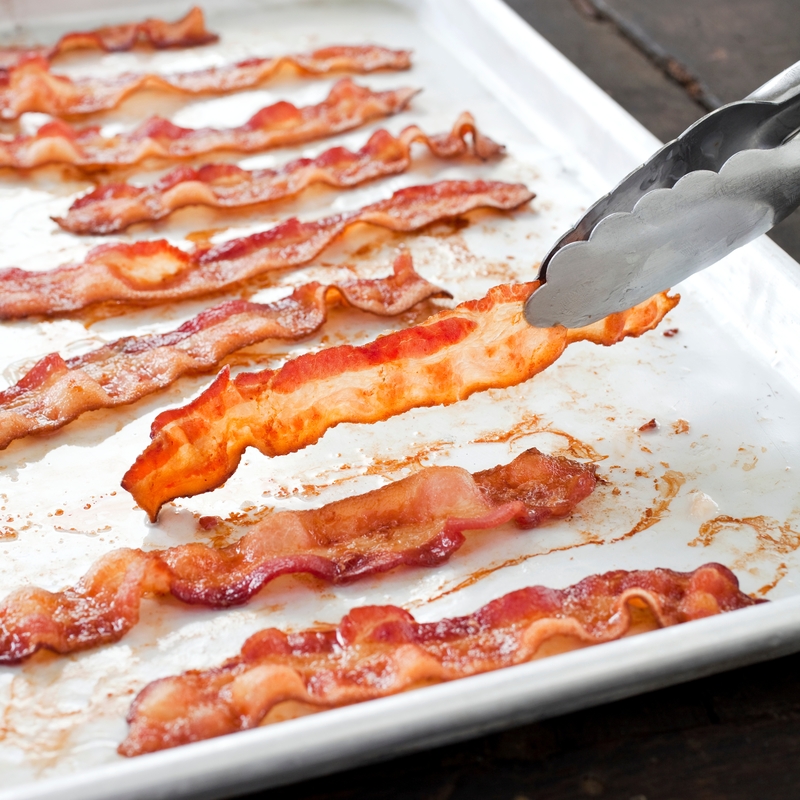 I cook bacon on a baking sheet with foil....no mess...even cook, perfect bacon! Brussel sprouts, caramelized in evoo, and sprinkled with balsamic vinegar and sea salt. I ill have to look up evoo. I like mine cut in half, roasted with very little garlic, olive oil and sea salt. I never noticed what kind, mine just said extra virgin. I see..
Just boil mine with butter and, some lemon pepper added. I make it in the crock pot with pork spareribs and cook it slow for 8 hours. I add a little brown sugar and celery seeds. Never had that, I might like it. Done correctly, it is spicy and pungent. Nobody mentioned sauerkraut. I make it in the crock pot with pork spareribs and cook it slow for 8 hours. I add a little brown sugar and celery seeds. I love kraut with roast pork or just sausages in the winter. Occasionally, I'll make potato dumplings or more often, spatezel to accompany it. I make my kraut with caraway seeds, diced onion, diced apple and beer. I would think because it's another preparation method of cabbage. I will be back later. I am leaving it open, so have fun and keep up the good behavior. I haven't found a vegetable that I don't like, raw or, cooked. You must be a masochist. I grew them in 2014 and all that I ever tasted was mind-blowing heat. I prefer milder peppers such as Thai dragons and cayenne. My limit is the red savina. Only if I'm mad at someone. I am a complete wuss when it comes to hot foods. I can barely deal with a light amout of Serrano peppers in something. My neighbors are Haitian and busy people so for giggles I made "poulet en sauce" a delicious chicken with a tomato sauce and the dish called for the peppers that were like 2 bazillion on the heat scale. I just went back and looked to edit. They're called "scotch bonnet" peppers. I made ours with Serrano and my ears smoked....theirs traditionally. She loved it. Surprisingly, he doesn't eat it....in heavily accented English he said "if it's spicier than macaroni and cheese, I don't go there"
A scotch bonnet is a close relative of the Red Savina and habanero. I usually grow 4-5 types of chiles and make my own hot sauce from the chilies that I don't use fresh. When I am cooking for myself or my BF I tend to throw in 3-4 Thai dragons for 2 servings. It's certainly hot enough to make us sweat but the heat doesn't last long. My neighbor's friend is from Mumbai/Bombay India and he loved the ghost peppers. That's about 500,000 HOTTER than the Ghost! That level is similar to weapons-grade pepper spray. I knew someone on another forum who grew them but he was scared to eat them. The Tabasco chipotle is my favorite commercial hot sauce. It's spicy but it isn't too hot to overpower other flavors and it has the smoke flavor. Seasonal veggies, sauteed or roasted. It's hard to pick, no pun intended. I guess onion would be my fav because it adds so much flavor to everything else. Is garlic a vegetable ? I guess onion would be my fav because it adds so much flavor to everything else. Is garlic a vegetable ? They are in a group of plants called "Alliums" (Garlic, Onion, Leeks, Scallions, Shallots). The unpleasant smell that often exists is because the contain Sulphur-- but that is also the reason they are considered "Superfoods". They may lower the risk of Cancer, and have other health benefits. They add a lot of flavour to a dish, but their positive effects are even stronger when eaten raw. I feel like you have to have onions in so many dishes. I'm going to get tomatoes for my wife's breakfast she loves tomatoes sandwiches. I make breakfast on Saturdays this time of year we worked our last Saturday for the year last week.